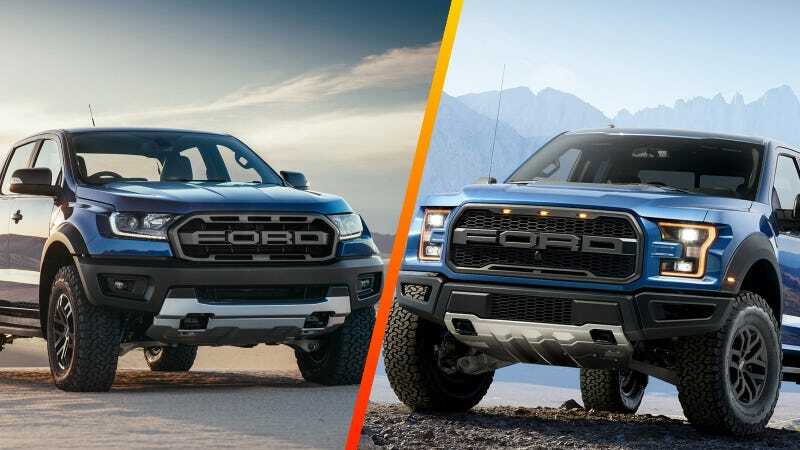 The Ranger Raptor is about the same height and width as the comically portly F-150 Raptor, and just over a foot shorter than the full four door. The F-150 SuperCab two-and-a-half door variant would have been even closer, but nobody buys those. The power disparity is a little more extreme. I think it’s safe to assume the F-150 Raptor will blow the doors and giant decals off the Ranger Raptor in a drag race. Correction: I had originally thought the Ranger Raptor’s shocks were 1.8-inch in diameter as Ford lists the Fox shocks in Ranger Raptor as having “46.6 mm (1.8-inch) piston for front and rear.” I regret the error. But drag racing is kind of a waste of a Raptor’s talents, anyway. These things are built to bashing over sand dunes and flying through soft terrain. For that, you’re going to want some fat tires and robust shocks. Since translating tire sizes to actual understandable measurements is slightly annoying, I don’t do it often enough. And for that reason, I have never truly appreciated how enormous the F-150 Raptor’s tires really are. Over a foot wide? Good lord. The Ranger Raptor’s are barely smaller, too. I think, of all the fancy traction control and fancy farkle bolted to this thing, those giant wheels are going to do the most for the thing’s earnest off-road ability. Some crucial data points we’re still missing on the new Ranger Raptor are curb weight and price. And, you know, whether or not it’s ever going to be marketed in America. But before you get too jealous of the Australians who will be able to take delivery of this “miniature” off-road monster soon, don’t forget that the automotive taxes and fuel costs down under are astronomical. You’ll probably be happy with your F-150 once we find out what people end up paying for Ranger Raptors.